Create a successful living room for comfortable conversation and many other leisure activities, that can be shared or enjoyed individually, with the sleek modern design of Tosha – Linen Modular Sectional by Ashley Furniture. 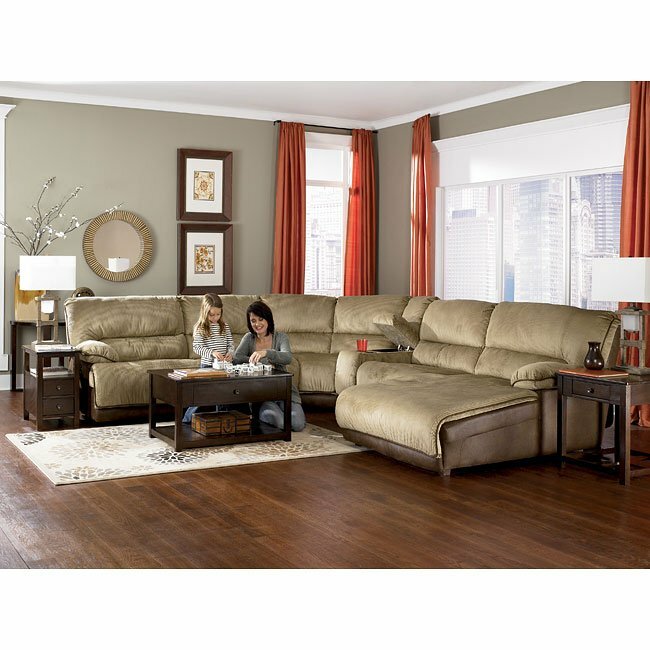 This sectional can be set-up in a number of combinations to fit within any living room area. The collection features thick boxed seat cushions and backs surrounded in a soft chenille fabric. When the sectional is formed, then plan the rest of the room around your favorite collective activities. Pair it, for example, with the Watson Occasional Tables or other cocktail tables to further enhance your living room area. Your seating group can double for fire or TV watching, or for music listening, when arranged with those functions in mind. Good lamps will be a great addition as well. If you have purchased any furniture from FurniturePick, consider leaving a review and let others know more about your experience. We Appreciate Your Feedback! Create a movie-theater experience with a clean and homey style by filling your room with Acieona-Slate Reclining Sectional Set by Ashley Furniture. Covered in a plush Chenille upholstery fabric adorned with contemporary styled stitched details, the Acieona – Slate Upholstery Collection by Ashley Furniture features the supportive comfort of thick divided back cushioning and padded arms along with plenty of function like the power strip and USB ports in the wedge and ample storage with a console and drop down table to create the ultimate living room collection. While the loveseat flaunts a storage console with two cup-holders, the three-seat couch has a hidden table top that flips down from the center seat to reveal two cup-holders and magazine storage. Set chips and snacks on the table-top wedge, or take advantage of its built in outlets and USB port to charge your media and entertainment devices. Complete your living room set by adding Kossuth Upholstered Ottoman with Storage, Hatsuko Lift-Top Cocktail Table or matching Niobe Table Lamp or Wilkes – Gray Rug. If you feel that this particular style or color doesn’t fit your taste, you can always choose other shapes, colors or materials from our enormous collection of sectionals or pick one from our Top 10 Selling Sectionals. All fabrics are pre-approved for wearability and durability against AHFA standards. Cushion cores are constructed of low melt fiber wrapped over high quality foam. Features metal drop-in unitized seat box for strength and durability. Sofa features a drop down table with magazine storage and cupholders. Loveseat features console with storage and cupholders. Did you purchase any furniture piece from FurniturePick? Consider leaving a review and let others know more about your experience. With a shipping season in full swing, many factors are quietly reshaping our spaces and our priorities at home. Whether it’s the move toward larger shared areas and blended places, new ways of looking at work and play, a desire for less clutter, or the need for energy efficiency, Ashley Furniture and FurniturePick announce the hottest trends in furniture that reflect our ever-changing lifestyles. #1 Sectionals– They’re hot, thanks to family rooms, more entertaining at home and fashion-forward, younger shoppers. Look for durable, high performance fabrics and leathers to make sectionals even more appealing this fall. #2 Storage Beds – They’re not just for kid’s rooms anymore. Beds with storage are entering master bedroom suites in a big way, with sleek designs inspired by elegant platform beds. This fall many of them will include enough storage to reduce the need for both chest and dresser. Top 10 Fall Furniture Trends 2012 by Ashley Furniture at FurniturePick. Part 1. With a shipping season in full swing, many factors are quietly reshaping our spaces and our priorities at home. Whether it’s the move toward larger shared areas and blended places, new ways of looking at work and play, a desire for less clutter, or the need for energy efficiency, Ashley Furniture and FurniturePick announce the hottest trends in furniture that reflect our ever-changing lifestyles. #1 Sectionals – They’re hot, thanks to family rooms, more entertaining at home and fashion-forward, younger shoppers. Look for durable, high performance fabrics and leathers to make sectionals even more appealing this fall.